The Hobbit is to Rankin/Bass what Rankin/Bass is to Christmas. When it comes to the holidays, Rankin/Bass owns me. The studio behind classic television specials like Rudolph the Red-Nosed Reindeer and Frosty the Snowman, as well as minor classics like Santa Claus is Comin’ to Town and even the Halloween-themed Mad Monster Party, are as much a part of my holiday viewing habits as Kevin McCallister and Buddy the Elf. It’s kind of amazing that one studio has such a hold on my traditions, or how easily I can be hardwired toward certain annual patterns. How do companies and studios work their way into our lives this way? Only two of the eight existing Star Wars movies have had December release dates so far, but I already associate Christmas with Star Wars. Thanks to the release dates of Peter Jackson’s six Middle-Earth movies and their multiple holiday-timed DVD Blu-ray releases, Christmas will also always be the time for Hobbits and quests over misty mountains. Maybe that’s what makes the combination of Rankin/Bass and their adaptation of The Hobbit such a perfect match for Christmas traditions. A quick overview of the Rankin/Bass lifespan looks something like this: the 1960s were the golden age where they burned brightest and produced their best, most memorable material. The 1970s were still pretty good, but definitely a bit behind the times; they weren’t doing their best work. The 1980s were their supernova years when they pumped out scores of episodes for successful syndicated shows like Thundercats and Silver Hawks, and released their best-received theatrical film The Last Unicorn. Unfortunately, the party ended in 1987, when Rankin/Bass Productions shuttered its doors and fell silent. It’s during those middling years of the 1970s that the studio produced their adaptation of The Hobbit, and it was a big deal. 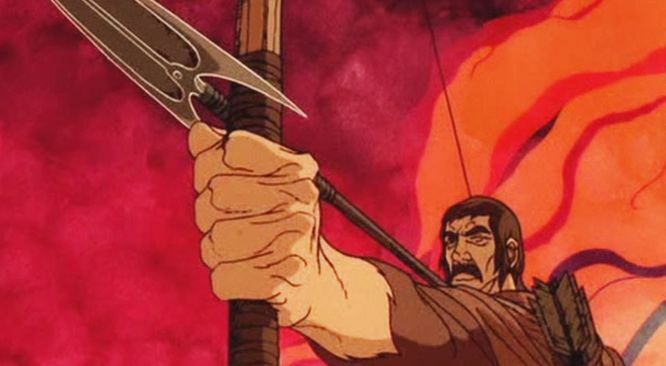 Ralph Bakshi had not yet mounted his ambitious rotoscope-animated telling of the first half of The Lord of the Rings, meaning that the Rankin/Bass movie was the first attempt by anyone to make a feature-length filmed version of J.R.R. Tolkien’s famous story. I’ll be upfront about the fact that it’s not necessarily a home run and is somewhat flawed. 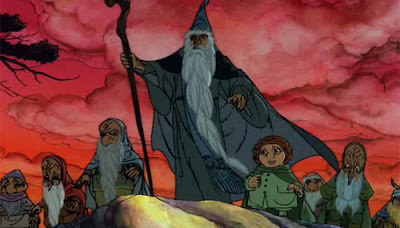 On the surface, The Hobbit seems made for animation; the lush and varied landscapes, the huge cast of characters, the fantastic creatures, and the ever-increasing epic scope of the story would have cost hundreds of millions of dollars to produce for a live-action film (as we would one day discover), while animation could convey every single odd beat of the story at a small fraction of that cost. 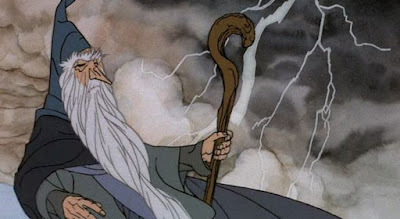 The adventures of Bilbo, Gandalf, and the thirteen dwarves who make their way to the Lonely Mountain to confront Smaug the Dragon and reclaim the heritage that has been stolen from them does indeed seem to lend itself to animation over live-action. I think, for the most part, Rankin/Bass did a remarkable job with the film. The film was created for American television under the assumption that successful viewing figures would lead to a theatrical run (which apparently never happened, at least in America). Because of this high profile, no expense was spared, and its 3-million-dollar-budget was the highest of any TV animated film ever at the time. The animation is pretty great, completed by a Japanese studio called Topcraft, which would later morph into Studio Ghibli, one of the giants in the anime industry. The voice talent was of an equal pedigree. Orson Bean, John Hurt, Thurl Ravenscroft and Paul Frees (without both of whom Disneyland wouldn’t be the same), Otto Preminger, Richard Boone, and even Hans Conried, the man who voiced Captain Hook in Disney’s Peter Pan, lend their vocal talent. We are used to celebrity voice casting today, but this didn’t exist back in the 1970s; the cast for The Hobbit, while perhaps not instantly recognizable to a modern audience, is made up of very talented film and television actors from that era of entertainment. Given that they had no roadmap other than the book itself and their track record for making entertainment that appealed to all ages, Rankin/Bass played it as safe as possible and used the original story as their map. 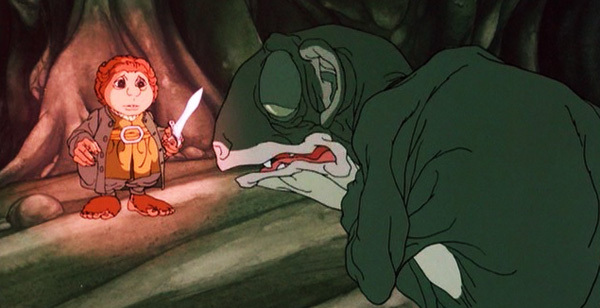 There was no input from the Tolkien estate: Tolkien himself had passed away in 1973 and probably wouldn’t have been amenable toward the cartoon anyway. He despised Walt Disney Animation for being too cute and insubstantial (fun fact: Walt Disney considered adapting The Hobbit themselves, but decided it couldn’t be done without abandoning the light tone they were known for), and was very harsh in his demands that any film adaptation adhere stringently to his books. To their credit, Rankin/Bass seems to have tried very hard to create something that would have made the professor proud. By nature and necessity, though, some changes had to be made in order to bring the story to life as a motion picture. Perhaps the most controversial of these was the decision to add musical narration in the form of singer/songwriter Glenn Yarbrough, a quaver-voiced folk singer who waxes on and on about “the greatest adventure” that Bilbo Baggins is about to begin. I like it, but I understand why others do not. Also working against the film, Tolkien fans are notoriously hard to please. The New York Times ran a piece on this animated movie on November 27th, 1977, the night the film premiered on NBC (during the holiday season, no less) and pointed out this fact and the gamble that Rankin/Bass were taking by investing so much in the adaptation. In general, the biggest complaint die-hards of the book have is that it condenses the story far too much and the characters themselves are too much of a caricature. However, the same New York Times article goes on to say that perhaps the then-new crop of fantasy movies like Star Wars owe their success to Tolkien in the first place and regards the animated film as an achievement. For me personally, there’s something about the Rankin/Bass movie that draws me in and holds me captive. There’s a sort of wonderful melancholy that hangs over the whole story, like a distant memory of a happier, better time that is gone and isn’t coming back. This is present in Peter Jackson’s version of this story as well, but somehow gets buried under the weight of the many diversions, side quests, and amusement-park-ride sequences with which Jackson populates the films. And yet, the animated film doesn’t work like the book does; it lacks the length and depth of the source material. This is where closure comes in. I’ve struggled for years now with my love of Tolkien’s world, his book The Hobbit, and my failure to completely connect to any of the adaptations of that book. I’ve been wanting the cinematic experience to replicate the feeling I get from reading the books. This is never going to happen, just as going to see the new movie with Spider-Man or The Avengers is never going to give me the same pure feeling I get from reading those characters in a comic book. If I’m being honest, most of the comic books aren’t that great, either. I’m chasing the magic of those few experiences that really impacted me and changed me, even though the rarity of the experience is what made it magical in the first place. When I watch these adaptations of things that I love, especially Tolkien’s Middle-Earth, I have to accept them for what they are and stop expecting them to give me the same feeling as reading that book so many years ago. Peter Jackson’s universe and the animated landscape of the Rankin/Bass film bring new ideas and visuals to the table, and that’s their strength. They make that world feel real. It doesn’t have to be a literal, word-for-word translation from page to screen to still have value, and it doesn’t have to be a great film. Most films are not great; I still watch and enjoy them. Such acceptance requires me to get out of my own way, which is definitely not an easy thing to do. Revisiting a movie like Rankin/Bass’ The Hobbit is a tricky thing because I’m chasing an experience from long ago, living on the fumes of that magic. It becomes difficult to discern between the quality of the film and the feeling that the film gives me. Maybe fans of a thing are the most unreliable sources for objective opinions on that thing because they’re speaking from a place of passion. Still, I think there’s something special about this movie, just like I think there’s something special about the studio that produced it. Rankin/Bass still exist in a fragmented, corporate version of what they once were, but the production studio that made these classics is no more. Their failures far outweighed their successes, as is the way of all things, but it’s their successes that I remember, especially around this time of year when their holiday fare is ubiquitous. Unlike many of their biggest successes, The Hobbit doesn’t play constantly on cable and isn’t a beloved classic. I’m not even sure that it’s a GOOD movie. But I do know that I admire it for being peculiar and different, and for coming closer than any other movie to touching that place within me that Tolkien’s words created. Thanks for this. I remember when I was a kid on movie night and the family would go to the video store, RENT a vcr and an adult movie and a kids movie. I would inevitably pick return of the Jedi, raiders of the lost ark, or this very movie. I appreciate this little history lesson, I haven't thought of this movie in a long time and now I feel all nice and toasty.